We started out this morning in Dallas…. I’m starting to get confused…. We’ve stayed in four different Texas cities and everything is starting to run together. I’m not the only MTTS-er who can’t remember where they’ve been. When you meet new people you ask where they started and how far they are going… The long distance people are starting to look a bit dazed. Too many early Rise & Shines following too many late Evening Owner’s Events. I don’t know how else MINI could do it… there is just so much road to cover in a day and only so many hours… We need a Nap Day thrown in here and there maybe. Today was probably our longest drive…. 488 miles. I slept A LOT… thank goodness. My mom wishes that I had slept that good in the car when I was little… maybe I would have, but she just didn’t drive long enough…. 100-150 miles… bam… I’m asleep. We finally made it out of Texas and into Arkansas around lunch time. I’d swear that the moment we crossed the state line the humidity quadrupled. That is something that I’ve discovered on this trip… I’d always thought that state lines were an imaginary kind of line… something drawn on a map and marked with a sign…. nothing tangible….. Nope! Crossing state lines begin/end all different kinds of landscapes, languages and heat indexes. Who knew!? Since we got into Memphis in the late afternoon on a Sunday… and all the sights were closed… Our big thrill of the day was dinner. My Father-In-Law loves… absolutely loves…. plans trips around… Corky’s Ribs & BBQ. Now, unlike my SIL, I totally get my FIL’s food style. If it’s food… it’s probably good…. if it’s different… we should try it. Yep… I get that. We tend to like a lot of the same foods too (not drinks, tho.. we totally disagree on coffees and wine). 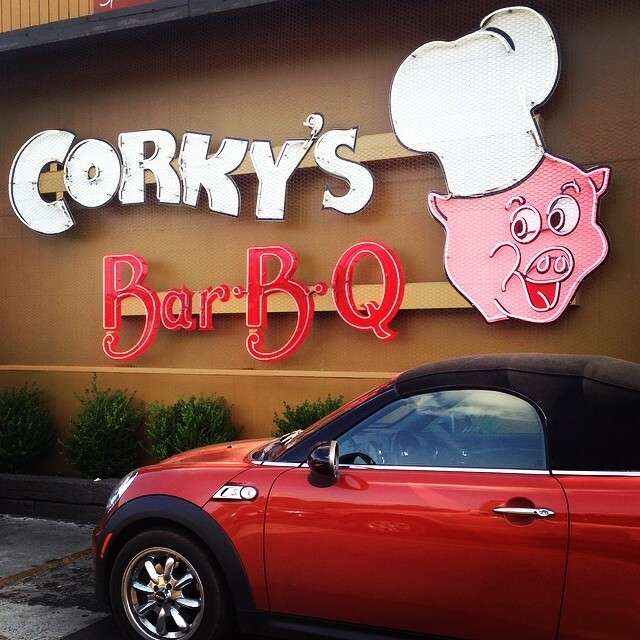 So as Brian and I are scrolling through Google’s recommended places I came across Corky’s Ribs & BBQ…. Well… ribs are a very Memphis thing….. what the hell? 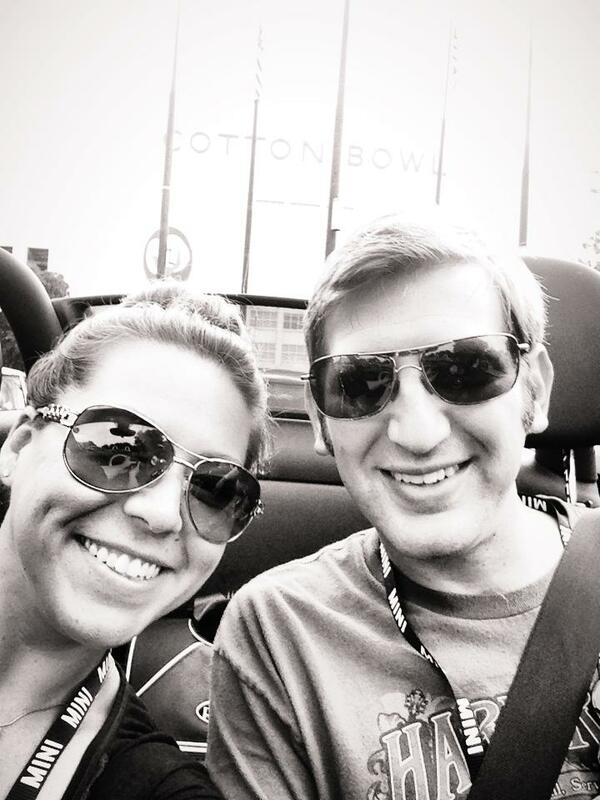 We got a parking space right up front… apparently we just beat the rush… and Posh got a cute picture out front. We sent that to Brian’s dad to make him jealous. I’d googled to see if the BBQ sauce was gluten-free and most of the things I’d read said it was. I checked with the waitress and she said that yes, the regular sauce was GF. I’ve never had a problem with any of the BBQ sauces that I’ve had before, but I’m trying to be extra careful to not get sick while we’re on our trip. I ordered the Rack of Ribs (1/2 Wet & 1/2 Dry)….. I think I like the ‘Wet’ better, but the ‘Dry’ was good too. I also got the Twice Baked Potatoes as my side… yum! You’d have thought I’d have had them before, but I can’t remember every eating them….. I found the recipe and those potatoes will be showing up at a Family Dinner Night soon. (So will Fried Pies, as soon as I figure out a good GF recipe for them…. I keep seeing signs all over the south for Fried Pies… and I want one SO bad!) Brian ordered the Loaded Potato and had plans to share my ribs…. he just let me order the giant meal so the waitress thought I was the cow! After dinner we decided to skip the Owner’s Event and just get to the hotel earlier. We’re having a great time, but we could use more sleep (napping in the car just doesn’t count.) Tomorrow is our last day on MTTS… It’s be a wonderful adventure, but I’m ready to get home. I miss my home and my family…. and I’m pretty sure my dog won’t speak to me and my cats have probably convinced my aunt to let them order pizza and pay-per-view every night…. it’s time to go home.